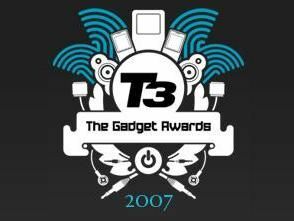 Vote for your favourite gadgets in the T3 Awards 2007. And win a PS3! Our colleagues over at T3 magazine and T3.co.uk are gearing up for their annual gadget awards. This year's awards include categories such as "Best Commuter Gadget". Can you travel happily without your iPod? Is your daily schlep to work a nightmare without Puzzle Quest on the Nintendo DS? Best gadget of all time? The gadget category that peaks our interest though is "Most Anticipated of 2007". Considering the hoo-hah around the iPhone and its imminent launch in Europe (fingers crossed for November), Apple's brave new mobile should walk it. PS3 and Xbox fanboys might not agree, however. Voting is open now. Point your browser to the T3 awards page to have your say.